For more than ten years, Connecting Michigan for Health has gathered change makers in healthcare to discuss sharing patient information in new and better ways. Together, we have broken through some of the largest barriers to sharing health information. Statewide health information exchange has transformed from an idea into action through a series of collaborative successes and milestones. Now is the time to boost the power of connectivity, as we collectively enhance and amplify data sharing within the state of Michigan. 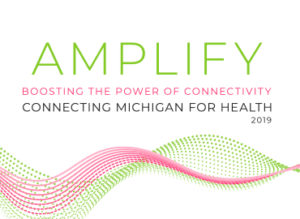 Join us in Lansing June 3 – June 5 at the 2019 Connecting Michigan for Health conference and discover new and innovative ways to boost the power of our connectivity! For information on the 2019 Connecting Michigan for Health, Legal Summit and Connectathon, visit www.connectingmichigan.net. Not just in healthcare technology, Michigan Health Information Network Shared Services (MiHIN) also likes to bring people together, hosting events and conferences around the state. These events spotlight the changes and successes in healthcare, from the local level to the national level. Healthcare is an ever-growing enterprise and because of that MiHIN can be found at other events and conferences around the country. MiHIN also hosts other events as needed, continuing to focus on the security and growth of Michigan’s healthcare achievements. Our managers have many years of presenting and sharing their healthcare knowledge around the country. Every October, MiHIN participates as a partner in National Health IT Week. Led by HIMSS, this annual celebration is an opportunity to raise awareness about the people who passionately work for better health IT to improve healthcare. In 2018, Governor Snyder issued a proclamation declaring October 8 – 12, 2018, as National Health IT Week in Michigan. Get involved with National Health IT Week and help recognize all of the hard work that you and your colleagues do each day to move health information sharing forward in our state! !